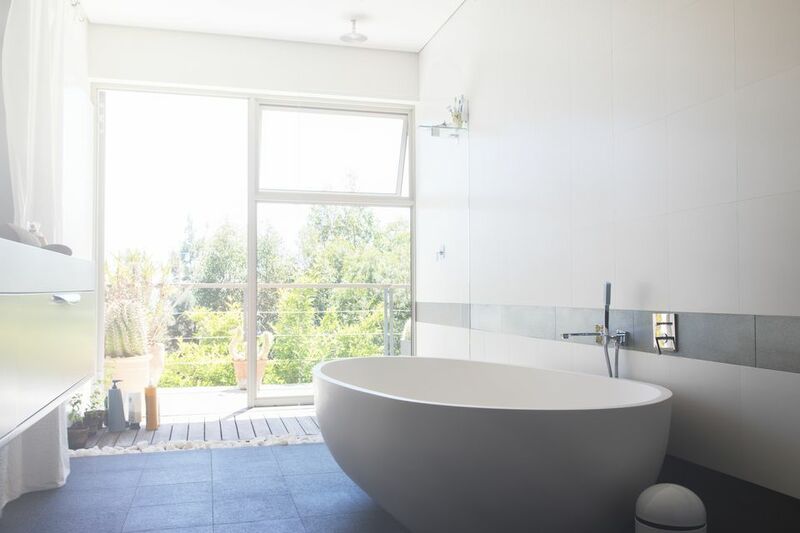 When it comes to remodeling a bathroom, the tub you choose can make or break the design. The right tub can transform your daily soak from a mundane chore into spa-like experience. Go beyond the typical budget shower/tub combo and consider a more unique option. Here are ten popular tub styles you should know about. By far the most common bathtub in residential use is the basic alcove tub. These are bathtubs enclosed on three sides, with only one exposed side. Typically the faucet valves are embedded in one end wall, and the alcove tub is frequently combined with a shower created through the use of walls that are tiled or covered with surround panels. Alcove tubs are found most often in apartments and in small full-function bathrooms. Small homes with a single full bathroom often make use of the alcove tub-and-shower combination. Larger homes that have one or more master bathrooms may use an alcove tub in the children's bathroom or guest bathroom. There are many styles and looks for alcove tubs. Many standard models are available "off the shelf" at home improvement centers, with dozens of specialized models available through special order. A drop-in tub is similar to an alcove tub, but its construction allows it to be surrounded by tile or another wall material on three or even four sides. It can also be dropped into a framed alcove space, exactly like an alcove tub, provided you create a finished face for the exposed side of the tub. Many whirlpool tubs use this design. With three or four exposed sides, as in this one from GNB Builders, this is a tub style best suited for large master bathrooms. Drop-in tubs require a bit more financial investment and work at installation, but the design is quite versatile and these tubs require little maintenance. Clawfoot tubs were once a classic and common bathtub, and today they are cute, retro, and oh, so trendy. Clawfoot tubs are one type of freestanding tub; this type sits on elevated feet rather than on its bottom surface. You can have a lot of fun playing with different types of feet and their impact on appearance in a bathroom. In this example, the feet are sculptural and their finish contrasts with the finish of the tub. An angled freestanding tub has one end that is higher than the other to provide support for your back, neck, and head as you relax in a hot bath. This angled tub by Highland Custom Homes (via Decor Pad) shows you just how comfy and modern the type of bathtub can look. Angled tubs are remarkably flexible in terms of style. You can pair it with traditional accessories as shown here for a classic comforting look, or put it in a modern space for a sleek take on the traditional freestanding tub. Undeniably modern, this freestanding tub is all curves and smoothness. This is the perfect accent to modern, geometric-focused contemporary styles. 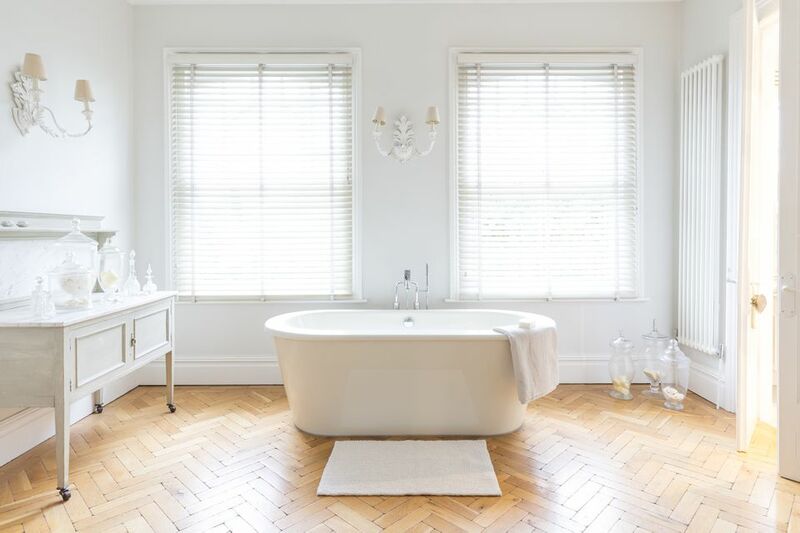 In this example, the sweeping roundness of the tub contrasts with the sharp angles of the walls and windows. This makes for an elegant balance of shapes and angles in this modern space. Sometimes a rounded freestanding tub just won't work with your style. That's when you can dare to use a rectangular freestanding tub, such as the one in this tub nook. Its clear, angular, sharp lines fit with the most contemporary styles. Notice how the tub shape contrasts with the spherical lighting fixture and the soft waves of a Roman shade. Using angles effectively is always about creating balance in the room design. The pedestal tub is another style of freestanding tub, which features a small raised section on which the tub sits. This gives the tub some extra height, as well as a retro look. Here, this freestanding tub also shows another popular trend—a copper finish. This finish is perfect for a rustic, farmhouse, or industrial home style. This traditional bathroom features a drop-in style corner tub. Corner tubs can come in both alcove and drop-in configurations (although drop-in is more common). A corner tub is sometimes used to save space but is also a good choice for large spaces where there is plenty of room. Corner tubs can be quite large—sometimes almost hot tub-sized. The best thing about corner tubs is the extra ledge space all around, where you can add beautiful decorative accessories. No need to hide this one behind shower curtains! The Japanese approach bathing from a totally different direction: They prefer to sit with water up to their chin, rather than lie down. This is a very space-efficient way to enjoy a good soak; we know that the Japanese are very fond of space-efficient things. This custom bath with Japanese soaking tub by Jonathan McGrath Construction is a beautiful example of a custom stone Japanese-style soaking tub. The wooden platform gives this space a zen-like rustic quality and a warm, welcoming style. Before the advent of the ceramic or stone tub, people took baths in wooden barrels. Usually made of treated cedar, modern barrel tubs are favorites in rustic and farmhouse decors. And they are definitely making a comeback. This particular cedar soaking tub, by Wright-Built (via Houzz) is very rustic indeed, with a faucet that looks like a hand-pump and several farmhouse accessories on the ledge. Notice the rough-hewn bench in the corner, where you can put a towel and bathrobe.